Basel, Rotterdam and Stockholm conventions to hold ‘sustainable synergies’ meetings aimed at solidifying collaboration among the three legally autonomous global agreements. Geneva, Switzerland, 15 April 2013 – The three conventions that govern chemicals and hazardous waste safety at the global level will, for the first time, convene jointly in an historic back-to-back meeting of the parties in Geneva from 28 April to 10 May 2013. Nearly two thousand participants from more than 160 countries will attend the two-week long meeting. The three legally autonomous conventions will begin by convening joint meetings of the conferences of the parties to strengthen cooperation and collaboration between the conventions, with a view to enhancing the effectiveness of their activities on the ground. Each convention will then continue individually to deal with its own specific topics over the two-week period. The meetings will culminate in a ministerial segment on 9 and 10 May 2013 dedicated to the theme of strengthening synergies between the conventions at national, regional and global level. The ministerial segment will be opened with scheduled remarks by Swiss Federal Councillor Doris Leuthard, UN Under-Secretary General and UN Environment Programme (UNEP) Executive Director Achim Steiner, Food and Agriculture Organization of the United Nations (FAO) Director-General José Graziano da Silva, and Global Environment Facility (GEF) CEO and Chairperson Naoko Ishii. Over 80 Ministers and Deputy Ministers are scheduled to attend. The joint meetings of the conferences of the parties to the Basel, Rotterdam and Stockholm conventions, opening on 28 April 2013, will review of the impact of the arrangements put in place by governments in 2011 to strengthen synergies among the treaties. The parties will also consider whether to make further modifications to the organization of the Secretariat, the programme of work and budget for joint activities of three conventions in 2014-2015, and a proposal for financing chemicals and waste related activities. There will also be joint discussions related to compliance, technical assistance and financing, reporting and POPs-containing waste. The sixth meeting of the Conference of the Parties to the Stockholm Convention will consider the possible addition of hexabromocyclododecane (HBCD) to Annex A to the Convention with specific exemptions for expanded polystyrene and extruded polystyrene in buildings. It also will work to adopt a non-compliance mechanism. The sixth meeting of the Conference of the Parties to the Rotterdam Convention will consider the possible addition of five chemicals and one severely hazardous pesticide formulation to Annex III of the Convention1. The conference will also work to adopt a non-compliance mechanism. The eleventh meeting of the Conference of the Parties to the Basel Convention will follow-up to the Indonesian-Swiss country-led initiative (CLI) on how to improve the effectiveness of the Convention and consider the possible adoption of a framework for the environmentally sound management of hazardous wastes and other wastes, as well as the possible adoption of technical guidelines on transboundary movements of electronic and electrical wastes (e-waste). For more information, see also the 2013 COPs website: synergies.pops.int. 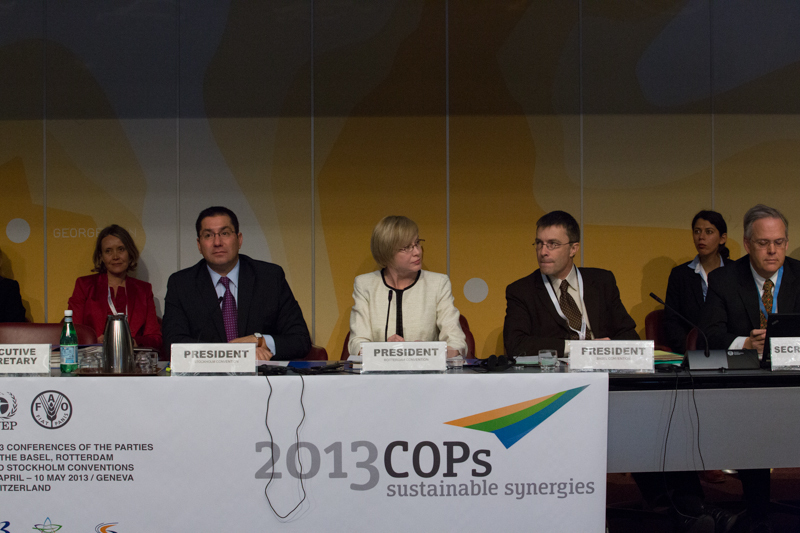 Follow the Basel, Rotterdam and Stockholm Conventions on Twitter @brsmeas. Rotterdam Convention on the Prior Informed Consent Procedure for Certain Hazardous Chemicals and Pesticides in International Trade currently regulates information about the export/import of 43 hazardous chemicals listed in the Convention’s Annex III, 32 of which are pesticides (including 4 severely hazardous pesticide formulations) and 11 of which are industrial chemicals. The Convention was adopted in 1998 and entered into force in 2004. It currently has 152 Parties. Stockholm Convention on Persistent Organic Pollutants currently regulates 22 toxic substances that are persistent, travel long distances, bioaccumulate in organisms and are toxic. The Convention was adopted in 2001 and entered into force in 2004. It currently has 179 Parties. The five chemicals and the formulation proposed for listing are: Azinphos-methyl; PentaBDE: Pentabromodiphenyl ether (CAS No. 32534-81-9) and pentabromodiphenyl ether commercial mixtures; OctaBDE: Octabromodiphenyl ether commercial mixtures; PFOS: Perfluorooctane sulfonic acid, perfluorooctanesulfonates, perfluorooctanesulfonamides and perfluorooctanesulfonyls; Chrysotile asbestos; and Paraquat: Liquid formulations (emulsifiable concentrate and soluble concentrate) containing paraquat dichloride at or above 276 g/L,corresponding to paraquat ion at or above 200 g/L. GEF-funded projects in Philippines, Mexico, China, Tanzania, Kenya show positive impacts of projects to clean up toxic chemicals and waste. 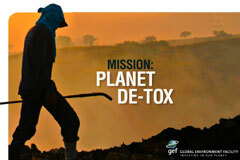 GENEVA, Switzerland, May 8, 2013 – The Global Environment Facility today premiered a documentary film, Mission: Planet De-Tox, now available free around the world, focusing on GEF-funded projects that address toxic chemical pollution on three continents. GEF CEO and Chairperson Naoko Ishii introduced the film to an audience of several hundred delegates, observers, and guests at a special event at the Joint Conference of Parties to the Basel, Rotterdam and Stockholm Conventions meeting in Geneva. General Santos City, the Philippines, where a huge, smoldering landfill emits toxic fumes. The unlined landfill, picked over by families risking their health to find valuables in the heaps of trash, is one of six in the country soon to be closed and rebuilt using environmentally sound methods. Mexico City, where electrical equipment that threatens to contaminate water supplies with toxic PCBs is being taken off line, properly disposed, and replaced with modern equipment. Some 2,500 tons of PCB-laced chemicals and equipment – 10 percent of the country’s inventory – is being replaced under a GEF-funded program. Morogoro, Tanzania, where a GEF-supported project is properly disposing of obsolete pesticides, including DDT, and to multiple locations elsewhere in Tanzania where GEF support is enabling the safe disposal of toxic medical waste. Changzhou China, site of a pesticide factory, now demolished, that was rendered obsolete by GEF-funded efforts to develop safe and effective ways of getting rid of termites without the use of toxic chemicals that can linger in the air and water for years. Nairobi and Mount Kenya, in Kenya, where new techniques are being used to control malaria-carrying mosquitoes, and where an air sampling station and a breast milk testing program, operating with GEF support, document the health threats posed by persistent organic pollutants. Data collected in Kenya feeds into the GEF/UNEP Global Monitoring Plan, which gathers data from all over the world to track hazardous chemicals. “The film calls for action – very, very urgent action – and we need to work together to spread this message,” Ms. Ishii told the gathering. The film is available on the GEF YouTube channel, http://www.youtube.com/GEFSecretariat. Groups and educational institutions interested in showing the film are encouraged to contact the GEF. The Global Environment Facility (GEF) unites 183 countries in partnership with international institutions, civil society organizations (CSOs), and the private sector to address global environmental issues while supporting national sustainable development initiatives. Today the GEF is the largest public funder of projects to improve the global environment. An independently operating financial organization, the GEF provides grants for projects related to biodiversity, climate change, international waters, land degradation, the ozone layer, and persistent organic pollutants. Since 1991, GEF has achieved a strong track record with developing countries and countries with economies in transition, providing $11.5 billion in grants and leveraging $57 billion in co-financing for over 3,215 projects in over 165 countries. Through its Small Grants Programme (SGP), the GEF has also made more than 16,030 small grants directly to civil society and community based organizations, totaling $653.2 million. For more information, visit www.thegef.org. Interactive app adds sizzle to the 2013 COPs. The Global Environment Facility (GEF) has released its newly redesigned newsletter “The Greenline” as an online app. The app is available free in the Apple iTunes app store. Compared to the original newsletter the new Greenline app offers an interactive reading and viewing experience featuring full-screen video clips and photo galleries, instant page-turns, and sharing opportunities. With The Greenline app installed, users will be notified when a new issue is released. GEF is also developing a version compatible for other tablets. The Greenline will continue to be available online at www.thegef.org in HTML format. The first issue focusing on Chemicals is already available on the GEF website. 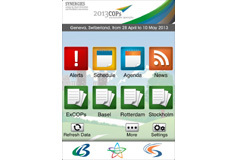 The GEF released the Greenline app at the back-to-back meetings of the conferences of the parties to the Basel, Rotterdam and Stockholm conventions, in Geneva, Switzerland, on 1 May 2013. Geneva International Conference Centre, Room 3, Geneva, 27 April 2013 at 11:00 a.m.
Geneva International Conference Centre / Centre International de Conferences Genève, Room 3, Geneva, 27 April 2013 at 11:00 a.m.
Swiss Ambassador Franz Perrez and Basel, Rotterdam and Stockholm Convention Executive Secretary Jim Willis to brief media on the eve of the conference. The three conventions that govern chemicals and hazardous waste safety at the global level will, for the first time, convene jointly in an historic back-to-back meeting of the parties in Geneva from 28 April to 10 May 2013. Nearly two thousand participants from more than 160 countries will attend the two-week long meeting. Journalists may notify of their intention to attend the 27 April 2013 press conference by emailing elisabeth.maret@bafu.admin.ch. Media accreditation requirements for the conference may be accessed at http://synergies.pops.int/?tabid=3136. 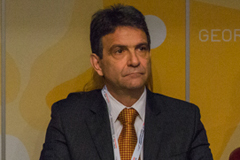 Clayton Campanhola, Executive Secretary of the Rotterdam Convention, Food and Agriculture Organization of the United Nations (FAO). I would like to join my colleague Jim Willis in welcoming all of you here this morning. FAO’s Director General, Mr. José Graziano da Silva, ask me to present his apologies for not being able to be here today, but he will be with us for the High-level Segment. This is my first Conference of the Parties as Executive Secretary of the Rotterdam Convention and I am very honoured to address all three Conferences of the Parties, Basel, Rotterdam and Stockholm today at the opening of these very special meetings, which reflect the progress we have made with regard to synergies. I would like to take the opportunity to talk about agriculture, not just because this is FAO’s mandate but above all because it is central to the Rotterdam Convention and to world society. Over the last 60 years agriculture production has been able to respond to the world’s rapidly rising demands for food, but this has occurred at significant human and environmental costs. Those include, among others, negative effects of pesticides and fertilizers on human health and on natural resources. Agriculture in the 21st century needs to be both safer and more sustainable. More sustainable, because agriculture needs to produce more to eradicate hunger in the world, while contributing to reducing poverty and protecting our precious natural resources. And safer because, in addition to providing environmental benefits, the agricultural sector will have to produce safer and healthier products for consumers. The central theme of the Conferences of the Parties for these two weeks is “sustainable synergies”. 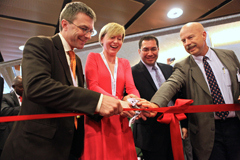 The Rotterdam Convention is a concrete example of FAO’s commitment to promote synergies. The Rotterdam Convention Secretariat, jointly hosted by FAO and by UNEP, is one of the first examples of synergies in the history of the 3 Conventions! The restructuring of the UNEP part of the Secretariat provided challenges in the synergistic way we work together, however, all colleagues in Rome and in Geneva are strongly committed to building and nurturing close and fruitful working relationships between our Secretariats to support Parties to protect human health and the environment from hazardous chemicals and wastes. The Memorandum of Understanding between UNEP and FAO, approved by the 2nd conference of the parties to the Rotterdam Convention and signed by the Director-General of FAO and the Executive Director of UNEP in December 2005 sets out the arrangements to perform jointly the Secretariat functions of the Rotterdam Convention and requests each organisation to assume responsibilities on the basis of their areas of competence, comparative strengths and experience; in particular, FAO having primary responsibility for pesticides and UNEP taking primary responsibility for other chemicals. The activities of the FAO part of the Rotterdam Convention Secretariat are closely in line with those of FAO’s Pesticides Management Programme responsible for example for the implementation of the International Code of Conduct on the Distribution and Use of Pesticides; highly hazardous pesticides, and the prevention and disposal of obsolete pesticides. Their activities address pesticides throughout their life-cycle and complement each other in the implementation of the Rotterdam Convention, but also in the implementation of Basel and Stockholm related issues in the area of pesticides. The Rotterdam Secretariat also benefits from the close cooperation with the technical officers in the 16 Regional and Subregional Offices of FAO, as well as of the currently 96 FAO representations worldwide. I would like to take the opportunity to draw your attention to the FAO stand which provides further in-depth information on this unique cooperation and mutual support. Next week 2 side events with FAO participation will take place, featuring highly hazardous pesticides and Sustainable Synergies through Sustainable Agriculture, the latter being opened by the Director General of FAO. A range of issues related to synergies and joint activities for the programmes of work for the next biennium will be presented to you for decision. Given that the majority of all chemicals addressed by the 3 Conventions are pesticides, we believe that the synergy process offers excellent opportunities for all 3 conventions to benefit from FAOs network of expertise. The individual COPs will also have to take important decisions as own legal entities. My colleague Jim already highlighted the exciting opportunity to come to an agreement on the compliance mechanism – and this is where we hope to benefit from the Basel Conventions’ expertise. Another challenge will be the adoption of a programme of work and budget that considers specific and joint activities. At the core of every COP is of course the consideration of chemicals to add to the so called PIC procedure and Jim perfectly pronounced the names of all 6 of them – so I will not even try. Being also FAO’s Director of the Plant Production and Protection Division, I would like to mention, in particular, the pesticide azinphos-methyl and the liquid formulations of paraquat dichloride at or above 276 g/L, which would be the first severely hazardous pesticide formulation to be included since the entry into force of the convention. This is a great example of how the Convention gives developing countries the opportunity to raise global awareness on the specific problems they face with pesticides. If this so called SHPF and the pesticide will be listed in the course of this meeting, this will prove once again how extremely useful the Rotterdam Convention is particularly to developing countries where agriculture plays an important role, but where conditions of use of pesticides often put farmers at high risk. Including a substance in Annex III of the RC is not constituting a ban! But it enables all parties to take informed decisions on future imports of the most hazardous chemicals. I would like to add that the discussions on listing these chemicals could not take place without the outstanding work of the Chemical Review Committee including their inter-sessional work and I would like to thank its members and the chair for this. In the spirit of synergies this technical body will hold its next meeting back to back with the Stockholm Persistent Organic Pollutants Review Committee and we are looking forward to hosting these meetings in October in the Headquarters of FAO in Rome. Rome would also have been the venue of this present COP based on the provisions of the Memorandum of Understanding, which foresees alternating the COPs between the seats of the Secretariats. However, due to the synergy decisions taken at COP5, the Joint Bureaux, based on the Joint Secretaries proposal, have decided to convene this event in Geneva. I would like to take the opportunity to express my gratitude to the Government of Switzerland for hosting us here, for their warm welcome and for supporting this meeting in an exceptional manner. I would like to join Jim in thanking the many donors for their substantive financial contributions that made possible participants travel to this important meeting. My thanks go also to the Joint Bureaux and the 3 Presidents for their outstanding preparation of this Meeting and I wish them all success for the coming two weeks. Before closing, let me return again to agriculture. Overall, sustainable intensification of agricultural production creates both positive and negative impacts on human welfare and livelihoods, particularly to those developing countries where agricultural exports are the main source of revenue. The challenges for agriculture production to assure global food security and sustainable management of natural resources are highly complex. I believe that global agreements such as these three Conventions are outstanding examples of what we can do together to build up a world free of hunger and malnutrition and at the same time conserve the global environment and take the advantage of the natural services provided, such as pollination, natural biological control of pests, carbon sequestration, beneficial invertebrates in soil and so on. FAO is committed to supporting the implementation of international agreements, codes of conduct and standards aimed at protecting, conserving and restoring natural resources. Presidents, excellencies, distinguished delegates, Ladies and Gentlemen, these Conventions are not just about chemicals. They deal with empowerment of poor countries and poor consumers and producers. I hope that in undertaking your work over the next two weeks you will keep the theme “ sustainable synergies” in mind. I consider these Conventions as truly output- oriented and concrete outcomes of the many international efforts towards sustainable development in recent years. Certainly, they are modest steps in the face of the challenges that lie ahead, but they can make a major difference. Ladies and Gentlemen, let me finish with assuring you my sincere commitment to the practice of our Secretariats of working closely together to provide a high level of support to Parties. I wish you very successful meetings and expect they can bring us important contributions. 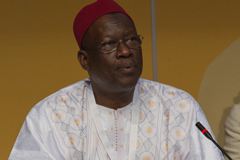 Bakary Kante, Director of the Division of Environmental Law and Conventions (DELC), United Nations Environment Programme. It is a distinct honour to address you this morning on behalf of UNEP Executive Director Achim Steiner, on the occasion of the opening of this historic set of conferences of the parties to the Basel, Rotterdam and Stockholm conventions. I am delighted to be here in Switzerland on the occasion of the second extraordinary meetings of the conferences of the parties to the Basel, Rotterdam and Stockholm conventions, the eleventh ordinary meeting of the Conference of the Parties to the Basel, Convention, the sixth ordinary meeting of the Conference of the Parties to the Rotterdam Convention, and the sixth ordinary meeting of the Conference of the Parties to the Stockholm Convention. Madam and Mister Presidents, the Government and the people of Switzerland deserve our deep thanks for the warm welcome and hospitality afforded to delegates meeting here in the beautiful city of Geneva. Mr. Steiner regrets that he could not be with you today. He very much looks forward to joining you next week to participate in the discussions of the high-level segment and closing session of these extraordinary meetings. This marks a milestone in the development of these three legally autonomous agreements. The manner in which the meetings are organized is but one indication of the innovative spirit which has flowed into chemicals and waste MEAs’ work, a process captured by the phrase, ‘sustainable synergies’. Synergies mean much more than the organization of meetings, more than the combining of the secretariats of the three conventions into an integrated, comprehensive organization. Synergies is the spirit in which work on implementation of the conventions is done, one that combines an approach for the sound management of chemicals and waste at all levels that responds in an effective, efficient, coherent and coordinated manner to new and emerging issues and challenges. The synergies process among the Conventions constitutes the first international effort to streamline environmental governance and as such has been on the leading edge of efforts to harmonize and improve cooperation and coordination between MEAs. It is a key part of the long-term effort to gear international environmental governance to the challenges of the 21st century. I applaud your courage in taking the synergies process to the next, higher stage of development, one that breaks the mold and continues to recast the framework of global environmental governance. The adoption of The Future We Want at Rio+20 and its endorsement by the UN General Assembly has reaffirmed the target, set in 2002 at the World Summit on Sustainable Development in Johannesburg, to by 2020 ensure that" chemicals are produced and used in ways that minimize significant adverse impacts on human health and the environment".At the Rio conference, Governments recognized the significant contributions to sustainable development made by the chemicals and wastes multilateral environmental agreements. In the year following the Rio+20 Conference, the world’s attention has been riveted on chemicals and waste management as never before. The 3rd International Conference on Chemicals Management, meeting under UNEP’s auspices in Nairobi last September, agreed to take forward work on five emerging issues,including hazardous substances within the lifecycle of electronic products. The publication of the first Global Chemicals Outlook and the Costs of Inaction report have demonstrated the unacceptable toll on human health the mismanagement of pesticides place on developing countries. The agreement reached in Geneva last January on the future global instrument on Mercury was another major step toward securing The Future We Want. The release of the State of Science of Endocrine Disrupting Chemicals 2012 and Summary for Decision-Makers at the UNEP Governing Council, and the adoption by that same body of a substantive decision on Chemicals and Waste Management, in February of this year, testified to the sobering challenges we face and the need to press ahead in the search for sustainable solutions to chemicals and waste management issues. The conference agenda of Basel, Rotterdam and Stockholm conventions before you respond to these challenges. To illustrate with but a few examples, the parties to the Basel Convention, will consider adoption of guidelines to address the environmentally sound management of electronic and electrical waste. The parties to the Rotterdam Convention will consider proposals next week to add to the Convention’s Annex III pesticides and industrial chemicals to ensure informed actions can be taken to protect human health and the environment against their harmful effects. And the parties to the Stockholm Convention will consider adding a widely used industrial chemical to the Convention’s Annex A, putting it on course for elimination from most applications. As you move forward, UNEP may be counted upon as a close partner. With the strengthened mandate UNEP received following Rio+20 and the decision of the UN General Assembly to open UNEP up to universal membership, UNEP is now in an even better position to contribute to the success of the conventions. UNEP and FAO have undertaken a review of the arrangements adopted pursuant to the “Synergies Decisions” on cooperation and coordination among the Basel, Rotterdam and Stockholm Conventions. The report provides an assessment of the progress made towards the implementation of the synergies decisions with the objective of establishing how the synergies process has contributed to enhancing cooperation and coordination at all levels. It is our hope that the findings of the review will assist you in developing further synergies among your conventions. We have moved the chemicals and waste agenda from a position of once relative isolation to centre stage on the development agenda. This is clearly where it belongs. With your help, the conventions will remain on the centre stage until we deliver enduring, sustainable solutions for 2020 and beyond. The Secretariat and its Unit of Public Information must be satisfied that the individuals applying for accreditation are bona fide media professionals and represent bona fide media organizations (formally registered as a media organization in a country recognized by the United Nations General Assembly). Accreditation will only be given on proof of a track record of reporting for media organizations on international affairs. Media accreditation is not accorded to the information outlets of non-governmental organizations. Applications are considered on a case-by-case basis and the decisions of the Secretariat and its Unit of Public Information are final. The Secretariat and its Unit of Public Information reserve the right to deny or withdraw accreditation of journalists from media organizations whose activities run counter to the principles of the Charter of the United Nations, or who abuse the privileges so extended or put the accreditation to improper use or act in a way not consistent with the principles of the Organization.